It is the goal of this writer to x-ray and explore the primacy and possibility of an incorruptible judiciary as a catalyst of equity and progression in a hitherto jaundiced and atrophied society by means of a three-pronged approach of an empirical, biblical and intellectual analysis. The writer copiously uses scientific, medical and legal lexicons in this essay. This essay would be likened to baking a five-step cake with an icing on it: introduction, information, inflammation, inquisition and introspection. INTRODUCTION: "THE DILEMMA OF BEATING ONE'S MOTHER"
Isn't that a weird statement? Can you beat your mother or order her to be beaten? Before you rush to passionately answer in the filially loyal negative, carefully read and enjoy the story below. Shamuel was a Caucasian Prince who lived in the 12th Century. His people seemed to be involved in constant wars with the Turks. Once he besieged a Turkish city with his army. As usual, his mother accompanied him. One night, he planned a surprise assault, but the enemy was lying in wait. His secret plans had been betrayed. The battle was lost. Distressed, Shamuel announced that the traitor, when caught, would be punished with 100 lashes of a whip, as the law stipulated. In great secrecy, he launched another attack but the result was the same. They had been betrayed again. But this time, the traitor was caught. It was Shamuel's mother! What if you were Shamuel? Or the judge sitting over a case of such intricacy? What would you do? In anguish, he withdrew to his tent for three days and three nights. What should he do? What would be the right thing to do? If he were to spare his mother, all could rightly claim that justice is governed by interests. Were he to punish her however, all would say: "Look at that merciless and cruel man! He doesn't even show pity for his own mother!" *R.O. ALABI ESQ., Associate, Festus Nweke & Co., Abakaliki, Ebonyi State. At last he appeared. His men gathered around him curiously. Then he addressed them; "We lost two battles because of treason. We lost many a man as a result of this. I find no excuse for the traitor. The crime was committed, and so punishment must be executed according to the law with 100 lashes. Righteousness and justice must be upheld! His mother was led into the circle. She was pale and trembling with fear. The executioner lifted his whip, but before the first lash came down on her, Shamuel cried: "Hang on! This is my mother; I am of her flesh and blood. I will take the punishment for her!" He went into the circle, took off his robes and commanded "Executioner, dare not strike more lightly than with the last prisoner. Do your duty!" This historical account, perhaps more than any in history, illustrates the standard and ideal of an incorruptible judiciary where justice is not only done but seen to be done despite precariously hanging interests, influences and inducements that may demand otherwise. No doubt, Shamuel's army and empire would have been inspired by the uncanny display of his judicial incorruptibility and the socio-economic harvests of that singular act of judicial integrity cannot be wished off. It is against this background and recent happenings in the Nigerian judiciary as well as a thorough examination of the concept of judicial corruption through the lens of history and the scriptures that this topic would be discussed and recommendations proffered for a way forward. According to Wiktionary, incorruptible means "not subject to corruption or decay" or incapable of being bribed or morally corrupted; inflexibly just and upright". To properly put the word in context, a definition of corruption is opposite. The Oxford Advanced Learner's Dictionary defines corruption as "dishonest or illegal behaviour, especially of people in authority". The Black's Law Dictionary defines judiciary as (i) the branch of government responsible for interpreting the laws and administering justice (ii) a system of courts and (iii) a body of judges. This implies that in a broad sense, the judiciary is the arm of government and especially the class of people who see to the administration of justice. In Nigeria, the judiciary is widely touted to be the last hope of the common man. The Longman Dictionary of Contemporary English defines 'Catalyst' as someone or something that causes an important change or event to happen. What is “just, consistent with principles of justice and right”. The Oxford Dictionary defines the word as 'fair and reasonable; treating everyone in an equal way'. Happening or developing over a period of time or in favour of new ideas, modern methods and change. 'People in general, considered in relation to the laws, organisations etc. that makes it possible for them to live together or a particular large group of people who share laws, organisations, customs etc. 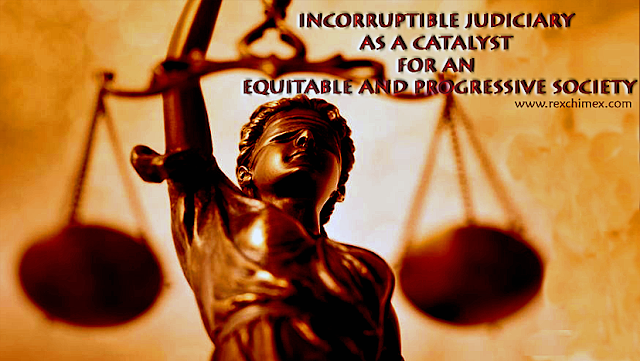 An attempt to x-ray the role of the judiciary in catalysing an equitable and progressive society begins at the theatre of diagnosis. It is first necessary to attempt an overview of what a corrupt judiciary is and the indications of its existence in a nation. Nigeria will be used as our case-study. Judicial corruption is not only entrenched but brazen in Nigeria. This has led many to opine that the judiciary is now a marketplace where the high and mighty trade justice for money. Election petitions, upon which the very life of democracy and legitimacy of government depend, as well as the growth and welfare of the public, are now manoeuvred behind the curtains of political/judicial connivance. The electoral and indeed democratic history of this country is inchoate without mentioning the brazen and bizarre manner in which justice has been reduced to a bazaar, in the very hallowed chambers of the judiciary officiated by supposed priests of justice. The Court of Appeal having once been the alpha and omega of election petitions particularly gubernatorial elections has been dogged with allegations of corruption in the most recent past. While the allegations are legion, the cases of Charles Soludo v. Andy Uba, Wammako v. Maigari and Fayemi v. Oni have all raised the spectre of corrupt inducements in perverting the course of justice. We all can remember with nostalgia the inglorious events surrounding the unceremonious bundling out of the President of the Court of Appeal, Justice Ayo Isa Salami in an alleged faceoff of corruption counter-allegations bordering on the election petition of Sokoto State governorship. More recently, against the backdrop of emerging judicial scandals in Nigeria, Supreme Court Justice Sylvester Ngwuta was arraigned in court on a 15-count charge bordering on money laundering and illegal possession of passports. Comparing the nation or a society to a body, the judiciary is akin to the limbs. The health of the limbs determines motion, movement and mobility of the body. It is, therefore, a sad case when the limbs upon which the polity, economy and strategic sectors of a nation depend suffer from the rheumatism of corruption. The deliberate refusal of the National Judicial Council (NJC) to investigate and sanction judges accused of corruption, abuse of office and other acts of misconduct by members of the public has encouraged judicial corruption... and impunity is endemic in Nigeria's judicial system. In other words, the outright failure of the judiciary to purge the Nigeria judicial system of corrupt practices has eroded public confidence in the judiciary. Suraju went on to list ten (10) petitions bordering on corruption which the apex judicial regulatory authority (NJC) failed to address at all or rather unsatisfactorily. 1. The petition against Justice B.A. Adejumo, President of the National Industrial Court for granting illegal exparte orders against two State Governments. The petitions were submitted to the NJC by the governments of Edo and Oyo States. 2. The petition written against four judges namely Justice Uwani Abba-Aji of the Court of Appeal, Justice Ibrahim Auta (Chief Judge of the Federal High Court), Justice Hydeladzira Nganjiwa and Mohammed Yunusa of the Federal High Court alleged to have collected bribes from Mr. Ricky Tarfa SAN currently undergoing trial for transfer of sums of money to the judges. The petition was submitted to the NJC by the CSNAC. 3. The petition bordering on why Justice I.A. Umezulike, ex-Chief Judge of Enugu State was retired on the recommendation of the NJC for launching a book where he collected N10 million from a litigant while Justice Ibrahim Auta who collected over N40 million in a similar book launch was not recommended for retirement by the same NJC. The foregoing is but the known symptoms of a pervasive yet covert system of judicial corruption where the corrupt minority desperate of obtaining illegal ex parte orders, rulings and judgments in political, commercial, environmental and human rights cases to mention but a few exploit the crevices in the system with the connivance of their lawyers, and play on the financial vulnerability of some members of the Bench to purchase cheap justice. This forces one to agree with the assertion by a member of the Bar that "there are lots of politicians in Nigeria who place judges on the payroll..."
It is unfortunate that the high tension dynamics of political and other parochial interests have been indulged to the extent that the judiciary has become so infiltrated and polluted. That is how best to describe the unending confusion and dilemma between the Presidency, the NJC, the Department of State Security (DSS) on the recent arrest and arraignment of judges with the accompanying media hullabaloo. A recent report from Global Corruption Barometer states that the Nigerian judiciary is widely viewed as one of the most corrupt institutions in the world. It has become quite normal for judicial officers to request for bribes to move cases along much faster. Some ask for financial compensation or other valuable consideration from parties to various cases to obtain a favourable ruling or to be granted bail. Corruption is the cancer at the heart of so many of our problems in the world today. It destroys jobs and holds back growth, costing the world economy billions of pounds every year. It traps the poorest in the most desperate poverty as corrupt governments around the world syphon off funds and prevents the hardworking people from getting the revenues and benefits of growth that are rightfully theirs. It steals vital resources from our schools and hospitals... It can even undermine our security. Surprisingly, judicial corruption is not limited to the bench or its regulatory body but it extends to lawyers, magistrates, lower cadre staff, registrars, bailiffs & sheriffs, clerks and even orderlies to the judges. Therefore, whatever chemotherapy we devise to cure the judiciary of this cancer must be extended to the benign tumours scattered across the landscape of justice. Corruption contributes to the problem of mass poverty and renders millions of citizens unemployed and uneducated… In Nigeria, corruption has led to decaying infrastructure, inadequate medical services, falling educational standard, mismanagement of foreign loans, reduction of production capacity, distortion of the economy through waste and mismanagement of resources. The writer is of the view that a reasonable man will undoubtedly agree with the opinions of the above scholars and moves to add that all the above complications arising from the cancer of corruption are as a result of the complicit negligence of the judiciary which stands in a fiduciary physician-relationship to the entire country. Once a thorough diagnosis of a corruptly sick judiciary has been established as this writer has attempted to do in the pages hereinbefore, one can safely proceed to briefly consider the parameters by which a virile incorruptible judiciary can be measured. 5. Encouragement of quasi-judicial mechanisms for dispute settlement. Space would fail the writer to point out specific examples but an objective look at the foundations and structures of the world’s top-performing economies will reveal an independent and largely incorruptible judiciary. The above indicators can be used as a standard against which judicial performance premised on incorruptibility can be found in Nigeria. All citizens must have equal access to justice, due process must be followed in any civil and criminal proceedings, the independence and autonomy of the judiciary must be continually upheld even as international best practices are followed in our judiciary whilst the adoption of non/quasi-judicial mechanisms are also employed to decongest our courts and ease the pressures which often breed corruption. In concluding this essay, the writer shall evaluate some biblical references and juxtapose them with the realities of a nation in dire need of an incorruptible judiciary. First and foremost, the judiciary is an institution ordained by God as seen clearly in scriptures. In the 13th chapter of the Pauline epistle to the Romans, Paul writes of obedience to civil and judicial authorities because they are God-ordained institutions. Paul connects the peace and progress of the society to those in authority (the judiciary inclusive). This means that the equitable and progressive society we all desire is not so much what God will do for us as what we proactively bring into reality by our prayers as believers. Several books in the Bible stand out as a sort of recipe book for an ideal judiciary. The Book of Judges stresses God’s interest in ideal justice despite the paucity of godly men. The Book of Proverbs is loaded with gems of counsel and prescriptions for incorruptibility in judicial officers. Some other random scripture verses forbid the giving and taking of gifts (bribes) in the administration of justice. The above scripture is the very words of God denouncing the condition in Israel at the time. No less does it apply to us today and very gravely warns that travesty of justice is a “mighty” sin. Proverbs 1:3 “To receive the instruction of wisdom, justice, and judgment and equity.” Here, equity is shown to be a product of justice. The demonization of the legal profession is in the writer’s opinion partly responsible for the judicial rut this nation is in. By directly and indirectly peddling the misconception that “no Christian can truly be a lawyer”, we sow the seeds of indifference in the young men and women who God intends to be judicial reformers. Since it is only lawyers that become judges and man the entire judiciary, the implication is that the life of Christ and the spirit of true incorruptible justice would continue to elude our judicial system until Christians take the gauntlet and build a new legal profession and by extension, a judiciary anchored on Christ. This writer, therefore, recommends that more and more of our young people are encouraged to take up the place of God on earth as administrators of justice. We cannot sit back idly and believe that ungodly men whose foundations are laid on faulty principles of selfishness, cronyism and other sharp practices will correct the anomaly of corruption in the judicial system. It must be conceded and addressed, the fact that, going forward, there is a severe crisis of confidence in the judicial arm of government. Do the courts meet the expectation of people in the discharge of its primary responsibilities? The answer is obviously in the negative. This is an addition to the reform of the appointment procedure for judicial officers so that only the best and indeed, honest lawyers are appointed to the Bench. Without the protection of human and property rights, and a comprehensive framework of laws, no equitable development is possible. A government must ensure that it has an effective system of property, contract, labour, commercial, personal rights law and other elements of a comprehensive legal system that is effectively, impartially and clearly, ad mistered by a well-functioning, impartial and honest (incorruptible) judicial and legal system. 2. New Edition for Advanced Learners 8th ed. 4. A.S. Hornby, “Oxford Advanced Learner Dictionary of Current English” 8th ed. (2010) Page 1172 8. Ibid. 6. A. Ademuwagun and K. Agyeman-Togobo, “Top Nigerian Judges On Trial For Corruption” available at www.mondaq.com/Nigeria/x/551424/white+collar+crime+fraud/brief+update+22+Nov+top+Nigeria+judges+on+trial+for+corruption accessed on 28/06/2017 at 1:56pm. 7. O.Suraju, “Cover Up Of Judicial Corruption And Impunity By The NJC” available at www.vanguardngr.com/2016/10/cover-judicial-corruption-impunity-national-judicial-council/ accessed on 28/06/2017 at 2:24pm. 8. T. Abayomi, www.channelstv.com/2016/10/24/lawyers-give-instances-corruption-nigeria-judiciary/ accessed on 26/06/2017 at 2:36pm. 10. H.A. Ajie and O.E. Wokekoro, “The Impact of Corruption on Sustainable Economic Growth and Development in Nigeria” published in International Journal of Economic Research and Investment [IJERI] vol.3, April 2012 at page 98. 12. I Timothy 2:1,2 (King James Version). 13. J.B. Daudu “Corruption and the Nigerian Judiciary: Matters Arising” available at www.thisdaylive.com/index.php/2016/10/18corruption-and-the-nigerin-judiciary-matters-arising/ accessed on 30/06/2017 at 8:50pm. 14. M. Dakolias, “Court Performance Around The World: A Comparative Perspective” World Bank Technical Paper No. 430, Page V.